Only about 100f breast cancer is linked to heredity and genes; the majority is associated with lifestyle and environmental factors. This means that you can take control of your breast health and work to prevent cancer and many other common breast problems. 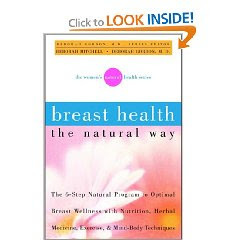 Uniquely created from a womans perspective, Breast Health the Natural Way offers you a wellspring of insight along with the information and tools you need to ensure the health of your breasts and the rest of your body. Great job putting this together! I recently ran into The Patients Advantage when looking for breast reconstruction surgeons. It's a great way to find the best surgeons and it does not cost a dime. Check them out (www.ThePatientsAdvantage.com).